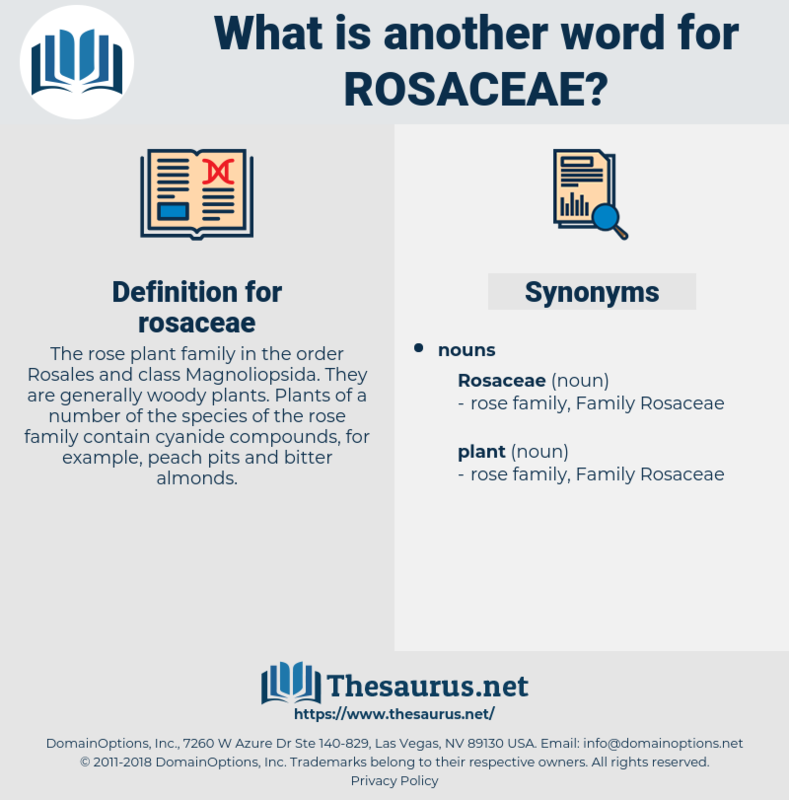 What is another word for rosaceae? 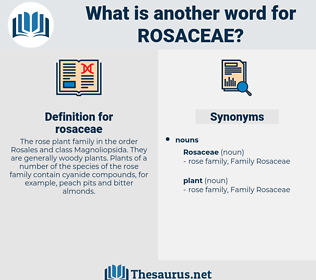 The rose plant family in the order Rosales and class Magnoliopsida. They are generally woody plants. Plants of a number of the species of the rose family contain cyanide compounds, for example, peach pits and bitter almonds. res, reecho, rook, rocky, rickshaw, rescue, rogue, rock cake, raree-show, rough, rico, rhexia, rouse, rachischisis, recco, reccy, rejig, rye whisky, Rex, rosy, ragusa, ricksha, raze, re-argue, raise, rissa, roc, rosa, rage, reggae, rous, rack, roseau, rusk, reseau, reassess, ross, rough-house, reich, rockchuck, rase, raceway, ruga, ruckus, rose, resew, rioja, rose acacia, riches, rehouse, rosaceous, rehearse, risque, rake, rachis, rococo, ross sea, rug, rise, raj, richea, rock, ragi, rag, recess, resize, rushy, rask, reissue, rorschach, rough-hew, rice, risk, racy, roughhouse, rockies, RG, ruscus, ruck, roguish, reek, rhus, rush away, rejoice, rugose, rucksack, reach, ruscaceae, Reyes, rousseau, rookie, rag week, recuse, rosacea, roux, row house, ruse, rouge, rakish, risc, roughage, rajah, rig, risky, roccus, rickey, reuse, rye whiskey, rehash, rework, rich, r.c., rash, roach, Rus, resh, recce, razz, Rya Rug, ragee, rhesus, rick, roughish, riga, raja, re-echo, russia, ras, rush, race, raucous. Family Amygdalaceae, cydonia, photinia, Genus Eriobotrya, amelanchier, chrysobalanus, Genus Malus, poterium, Genus Potentilla, Genus Chrysobalanus, prunus, Genus Chaenomeles, Genus Pyrus, Genus Crataegus, Genus Spiraea, Genus Cydonia, Genus Heteromeles, Genus Poterium, pyrus, Genus Photinia, Genus Mespilus, Genus Geum, heteromeles, geum, Genus Rosa, sorbus, fragaria, Genus Prunus, eriobotrya, chaenomeles, crataegus, malus, rosa, dryas, Genus Amelanchier, mespilus, amygdalaceae, Genus Rubus, Genus Pyracantha, Genus Sorbus, potentilla, Genus Fragaria, genus cotoneaster, rubus, Genus Agrimonia, spiraea, Genus Dryas.